I made this goofy little snowman by stuffing a plastic grocery bag with old newspapers and covering it with paper mache clay. The idea for using a stuffed plastic bag for a form came from Laurie Baker’s guest post showing her wonderful Halloween pumkins. My snowman isn’t nearly as big, since Laurie used garbage bags and I used grocery bags, but there’s no reason you couldn’t make a really big snowman if you wanted to. I admit my first little snowman does not qualify as great art, but for just a few hours of my time, I think he came out OK.
First, stuff your bag with old newspapers, and then use string to create a neck. Use masking tape to cover the open top of the bag, and to cover any folds. Push and poke your bag until you get a shape and attitude you like. If needed, add some more masking tape to keep the shape. Now cut round or oval piece from scrap cardboard and tape it to the bottom of your snowman so he has a nice flat surface to sit on. I used plastic (Scotch) tape because I didn’t want to cover the bottom with paper mache clay (large flat surfaces tend to warp when they dry). 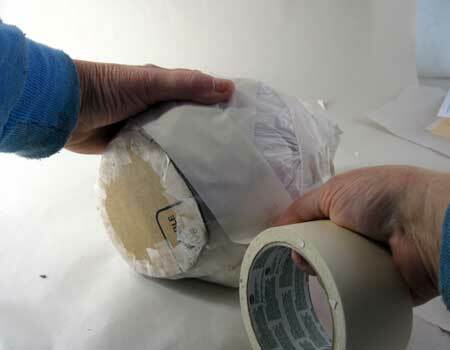 Masking tape is designed to be easy to remove, so it will unstick itself over time. The plastic tape should stay on longer. I then reinforced the connection between the cardboard bottom and the plastic bag, and made a nice smooth transition, with more masking tape. Now add small balls of “coal” for his buttons and eyes, make a twist of newspaper for his carrot nose, and build a warm knitted hat out of a long twist of newspaper around his head and a ball for the top. 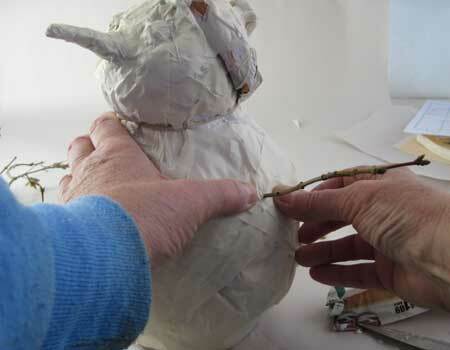 Then poke a hole in the plastic bag and insert twigs for the snowman’s arms. Note: Use strong twigs, or leave the arms until after your snowman is painted. I broke my first pair and had to replace them. If you add the arms later, drill a small hole through the clay, plastic and some of the newspaper inside, put a dab of glue on the end of the twig, and then poke it in. Sit your snowman on a piece of cardboard or a baking sheet, which you first cover with plastic wrap. This will make it much easier to move your snowman while you work. It also makes it easier to move it from your work table to a warm place to dry after the clay has all been applied. (I forgot to do this, myself, and it made things difficult). 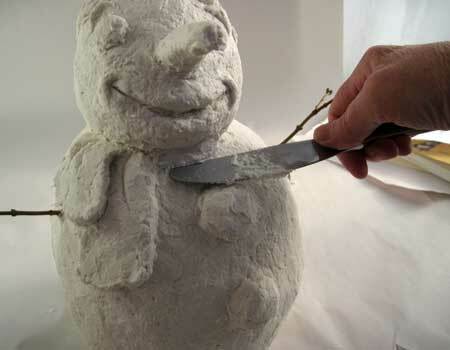 Now make up some paper mache clay and spread it onto your snowman with a knife. I just updated my original video that shows you how to make the clay, because I’ve changed the recipe just slightly. The new version is actually easier to makeÂ than my original recipe. 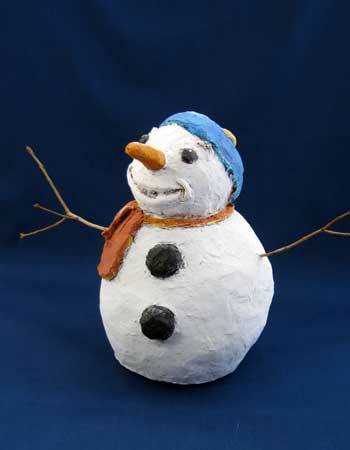 You can see the recipe and directions for making paper mache clay here. 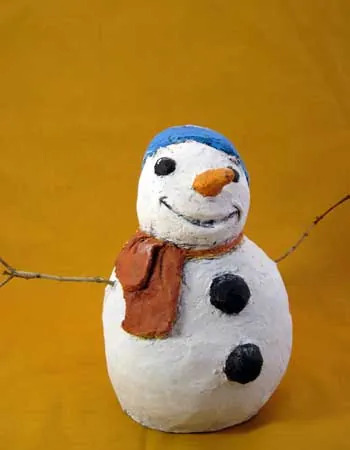 If you don’t want to run to the hardware store for your clay ingredients, you could make your snowman with the traditional paper strips and paste. It will take slightly longer, but it should still turn out just fine. I decided at the last minute that my snowman needed a scarf, so I added more clay in that area and used my knife to sculpt the scarf. I also added a thicker layer for the mouth area so I could add some lips. Because these areas are thicker than the rest, they will take longer to dry. Now put your snowman in a warm place to dry, perhaps near a radiator or heat register. Allow him to dry completely. There should be no “give” at all when you push on any part of him. Be especially careful to check any area that has a thicker layer of clay, like the scarf. Now just paint him any way you like, and put him out for a cheerful display. If you give him away as a gift or make some to sell at a craft bazaar, you would want to cover the cardboard bottom with white felt. I’ll try again to attach a photo. I’ve been trying to make a giant snowman for the last couple of days and I’m running into some trouble. The snowman has three sections. I made a large toile sleeve as the body, stuffed it with newspaper and used masking tape to create the shape. The paste clay is having problems sticking to the form, especially the vertical parts and undersides of the balls. Did I need to cover the entire form with masking tape? How do I keep it from sliding due to gravity? I haven’t use the voile myself, but it sounds like it’s a material that the glue in the clay doesn’t stick to. That would probably mean that it needs to be covered with tape. If you put a thin coat over the tape, 1/8″ or so, and if the clay is stiff enough to not be runny, it should stick to a vertical surface. For the underside you might need to turn the snowman on his side. Thank you for your beehive advice. This sounds much easier than what I had been initially planning! I haven’t worked with paper mache since I was a kid at school! Why is it some of us ignore these fun things when we’re older? 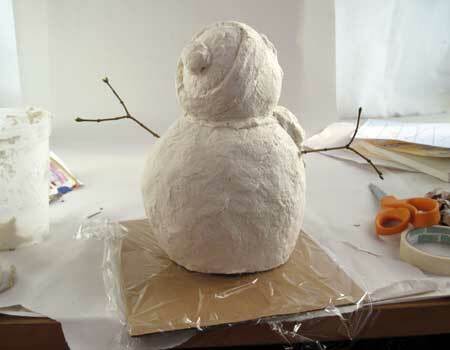 I want to make a paper mache snowman now for Christmas, and maybe do a Father Christmas if I’m feeling brave enough! Lisa, you can use anything you like as an armature for paper mache. That’s one of the things that make this medium so much fun. It sounds like you have a great plan, and I hope you let us see your snowman when it’s done. I just made my first paper clay today. It turned out great. I have one question. Can I layer the clay or do I have to complete an entire area first. I put on a thin layer, but want to go back and add detail. How many layers have you been successful with drying in between. Really enjoy your website and information. If you let each layer dry completely, you can add more, for details or whatever, as often as you want. I usually end up with one thin layer for a base, and then I add some more where details are needed or where I want to add a texture that didn’t get done in the first layer. this was my question, too….I also wonder if I can put items in the dehydrater to dry them quicker? I love your site and am really enjoying frosting my items rather than stripping them…..Thank you for any answer you provide…. Hi Deb. I haven’t tried using a dehydrator, but it’s an interesting idea. Try a small item and see if it dries evenly. And be sure to let us know if it works! clay.God bless you.Iwatched on you tube.You are very special angel. First of all, love your work!!!! I’m doing a science project on modeling a 3D animal cell. I thought that i would make a big circle out of the paper mache clay for a base. I just had a few questions. 1) Once i’ve made the cirlce and after it has dried, is it possible to cut it open just like the picture at the bottom or would it be better to cut it open using plain old paper mache? 2) Can clay or play-doh stick on th paper mache/clay after it has dried? 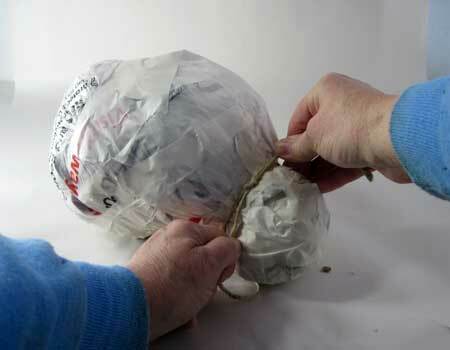 Yes, you can cut the paper mache clay and remove the form to make it hollow. In fact, I just did that with my experimental chimp bust. I don’t know about the play dough – you’d have to try it and see. I have not tried it myself. Ha, well I was looking at the page about outdoor sculptures and when I clicked on this I was expecting a “lifelike?” statue of a snowman!! Very cute little guy. I had to laugh as I was imagining a big snowman that would be fun to have ready to put outdoors when it snows, a big huge one that everyone wonders how they could work so hard in that snow and get it that big, you know – one of those kind. I was wondering what ‘Joint Compound’ is? Do you use it for joining plaster? I am in Australian and have not heard of it before. Hi Debra. Another reader from Australia says it’s called Joint Finish in your country. You normally use it to fill in the space between two pieces of plasterboard when building a wall. You need the kind that’s already mixed, so it looks a little bit like wet plaster. It’s sold in a plastic tub. The primary ingredient is usually calcium carbonate. the snowman is cute! but i can’t see the video. There is no video. Just pictures and text. I love this project! Thanks so much, I’ll be linking tot his. He’s really cute! I love this tutorial!